What do bad boys, Red Bulls and cookie dough all have in common? They all bad for us, but yet irresistible. Despite the risks of heartbreak, elevated heart rate and salmonella, we can’t help but stay away. Just as we can admit to having fallen for the bad boy or consuming one too many caffeinated energy drinks during finals season, most of us are also guilty of having slipped our hands into a bowl of unbaked cookie dough. Even while aware of the dangers of eating raw eggs, the combination of sugar, butter and other pantry ingredients is difficult to resist. Like the apple Eve eyes in the Garden of Eden, cookie dough is the forbidden fruit of the kitchen. While there is no way to ensure that bad boys won’t continue breaking hearts or to convince ourselves that the unpronounceable ingredients of Red Bull are healthy for us, the fear of salmonella poisoning from cookie dough can be eradicated. Thanks to Lindsay Landis of Love and Olive Oil, now there is an entire cookbook dedicated to fingerfuls of dough. The Cookie Dough Lover’s Cookbook is filled with recipes for everything from cake to brownies to ice cream sandwiches made with eggless, raw cooking dough. Just when you thought cookie dough could not get any more irresistible, Landis’s recipes elevate the basic dough to something extraordinary. Think Mexican chocolate cookie dough tartlets, white chocolate macadamia nut cookie dough ice cream and Belgian cookie dough waffles with chocolate whipped cream. In conjunction with the launch of Landis’s first cookbook, Quirk Books has asked various food bloggers to create their own delectable treats using the author’s eggless cookie dough recipe. Throughout June, you can find the participating bloggers’ recipes on Endless Simmer during the first-ever The Cookie Dough-lympics. As a child, I often had red hands after a quick slap when my grandmother caught me snatching a piece of raw dough. It was my guilty pleasure, something I could not resist. Had my grandmother been with me during those late nights with my best friends and a package of cookie dough, my hands would be permanently red. Besides the sugar high from the dough, coffee fueled many of those gossip, cookie-filled evenings. Flipping through Landis’s cookbook, the idea of combining three of my favorite guilty pleasures, espresso, cookie dough and chocolate, led to the development of Triple Espresso Shot Cooke Dough Brownies. With instant espresso powder in the brownie batter, cookie dough and the glaze, these sweets are not only rich, but also devilishly decadent. 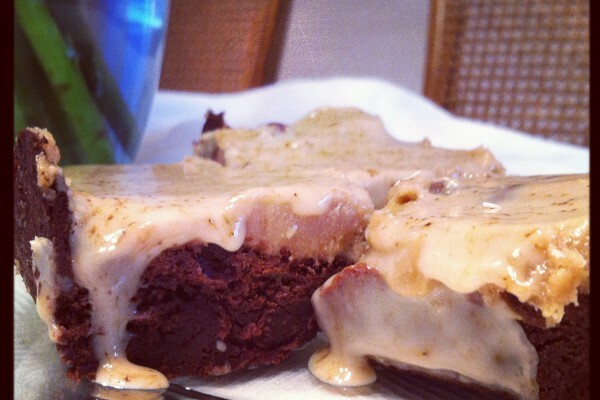 The coffee amplifies the flavor of the chocolate for a coffee break in dessert form. Though not for the faint os heart, these triple shots are like the bad boys we just can’t help but drool over. For the brownies, preheat oven to 350°F. Grease a parchment paper-lined 9×9-baking dish. Combine wet ingredients—the melted butter, sugar, and vanilla in a large bowl. Beat in the eggs, one at a time, mixing well after each, until smooth with no lumps. Sift together the flour, cocoa powder, instant espresso powder and salt in another bowl. Add the wet mixture to the dry ingredients. Spread the batter evenly into the prepared baking dish. Bake in preheated oven until an inserted toothpick comes out clean, about 30 minutes. Remove, and cool pan completely on wire rack. Prepare cookie dough. In a large bowl beat together butter and sugars with an electric mixer on medium speed until light and fluffy, two to three minutes. Mix in milk, vanilla and espresso powder. Add flour and salt and stir until incorporated. Gently spread dough onto cooled brownies, smoothing the top into an even layer. Refrigerate while preparing the glaze. For the glaze, in a small bowl, sieve the confectioner’s sugar. Add the milk and instant espresso. Whisk until smooth. Pour over cookie dough, carefully spreading into a thin, even layer. Return pan to refrigerator and chill until set, about 30 minutes. To remove brownies from pan, grasp the edges of the parchment paper and lift out the entire block. Place on a cutting board and use a large sharp knife to cut into squares. Refrigerated in an airtight container, brownies will keep up to three days. 6/12: BigGirlsSmallKitchen.com, @BGSKCollege – US!